Summer Food Shopping - Watermelon Please! The top summer foods reflect the vibrancy of "rainbow eating", packed with vitamins and minerals to fel the body for the early sunrise and late sunset of the season! Tomatoes, Strawberries, Blueberries, Raspberries, Zucchini, Peaches, Plums, Cucumbers, Corn, Watermelon, Green Beans, Leafy Greens, Rosemary, Basil, Oregano, Mint. The list above is a great foundation for a wide variety of lip smacking salads and thirst quenching beverages like the lemonade recipe below. 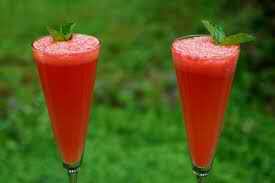 Blend watermelon, raspberries, water, agave nectar and lemon juice together until smooth. Strain through cheesecloth or a fine mesh strainer. Refrigerate until chilled, and then serve. Watermelons are an excellent source of several vitamins A, (an antioxidant which helps maintain eye health), vitamin C (helps build the immune system, heal wounds, prevent cell damage, promote healthy teeth and gums), vitamin B6 (helps brain function and helps convert protein to energy). 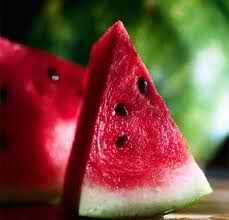 Speaking of antioxidants, watermelon has the highest concentrations of lycopene of any fresh fruit or vegetable. Lycopene (also found in tomatoes) is a powerful antioxidant that helps fight heart disease and several types of cancer — prostate cancer in particular. And if that wasn’t enough, watermelon also contains amino acids that can help maintain arteries, blood flow and overall cardiovascular function.